2015's year of Pro Surfing was beyond incredible and at the same time brutally punishing. The world's best surfers were absolutely pushed to the bloody edge to discover their limits, to challenge themselves on more levels then we could imagine. Some possessed by super human powers, gladiators showing us how to dig deeper, how to reach in and find the courage to continue when it counts all in the true spirit of sportsmanship, friendship and what it means to be your best. It's always under these situations of extreme pressure that we get to see the raw and true nature of the being. Throwing care to the wind – Mick coming in and Bede going out. Synonymous for being in the Big Wave category, not too many surfers on the tour think about surfing such a massive wave as Waimea Bay, especially not during the holding period and just before the contest that will decide the world title. Bede focused on a personal challenge – Waimea Bay. Courageous Bede Durbidge is part of a hand full of surfers, a small brigade of elite athletes on the tour, that continually push the limits with total disregard for their own safety. These guys throw themselves over the falls even when there's only the slightest chance of making it. They are the instigators of why surfing is currently at it's the highest level. Competition surfers are usually calculated risk takers and tactical thinking is their formula for success – Bede is a different breed. Side slipping on one of the most dangerous waves in the comp, resulting in a horrific wipe-out of epic proportions. 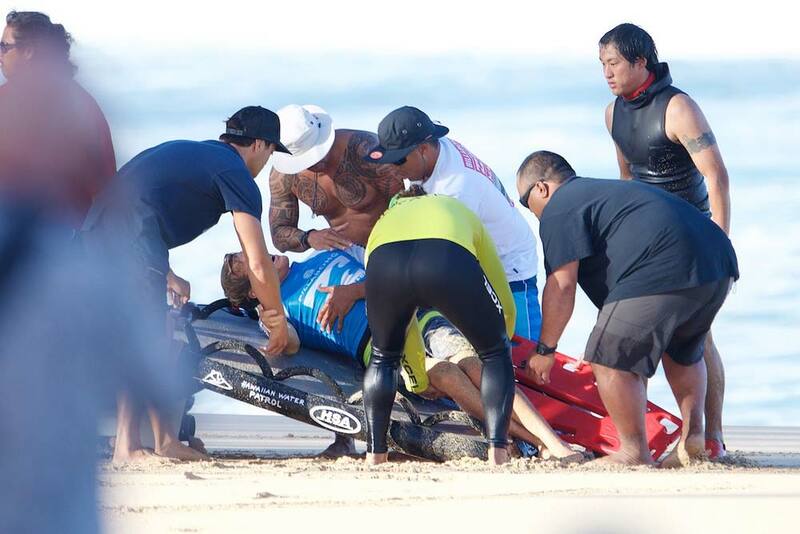 Heavily smashed onto the worst spot on the reef at Pipeline, he eventually surfaced in pain, water patrol quickly delivered him to the beach and he was rushed to hospital. Fast action by the water rescue team delivered Durbo safely to the beach before being rushed to hospital. I can't even imagine how much pain he was in. After visiting Bede in hospital back on the Gold Coast, he tells me it was the kind of pain that registered off the richter. 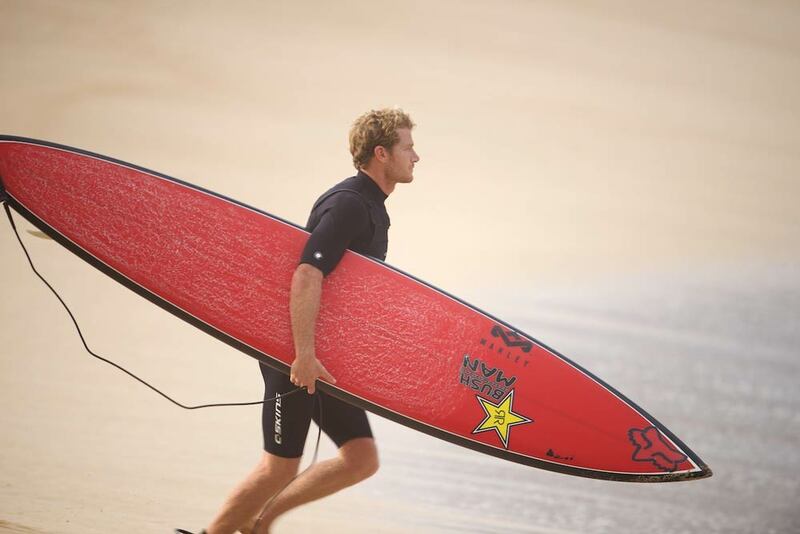 Owen Wright – consistently chased epic swells on his own time. Refining his surfing to the highest degree in arenas that are totally unforgiving. He dominated the most perfect swells of the year at the notorious Teahupoo in Tahiti, Cloudbreak in Fiji and finally Pipeline in Hawaii - the three gems of a goofy footer. Laying down a critical bottom turn under a threatening Pipeline lip to set a line for his usual barrel fest. Owen Wright, known for being a consistent charger – In my personal opinion I believe Owen was the best surfer in 2015 when the surf was in excess of 10 foot. Mr Wright was not only the best surfer, but he hunted down every swell possible around the world besides from his tour commitments. Prior to the Billabong Pipeline Masters he was hands down the best surfer in the water – Fate can be cruel. Owen Wright emerging from a spit, having yet again successfully negotiated the complex arena of Banzai Pipeline. At this stage Owen is totally unaware of the severity of the injury that had just incurred. A huge set at Pipeline just cleaned up nearly all the surfers and thrashed them mercilessly. As Owen walks up the beach he comments something to the effect of that was pretty heavy, then proceeded back to the Rip Curl house for a nap to wake into a nightmare. 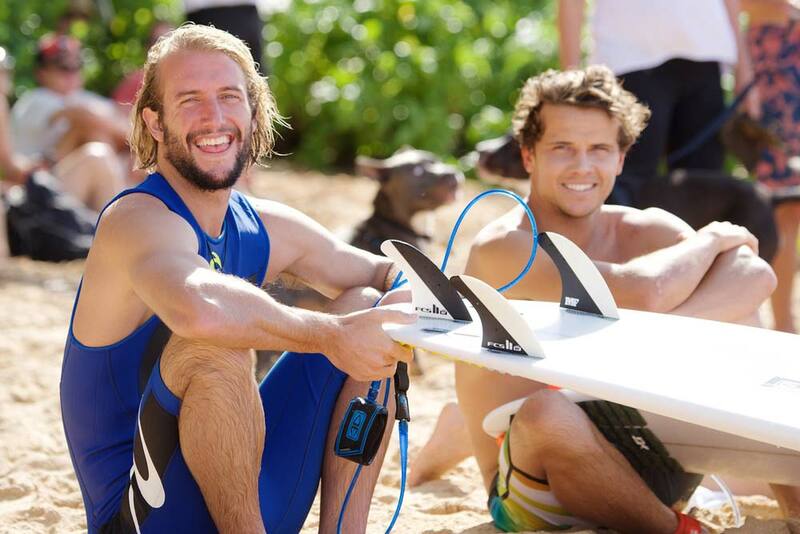 Looking out for each other that day – Owen Wright and Julian Wilson at Backdoor. He is one of those freak talents in a very small club with the likes of John John Florence and Jamie O'Brien. Julian had such a spectacular year in and out of the surf. Ranking No. 4 he came so close to a world title and is now starting this year by celebrating his engagement. Here at Pipe cranking a power bottom turn that would be the envy of old school power surfers – No bones broken just shattered dreams. Bourez about to get smashed at Teahupoo on one of the worst wipe-outs he's ever had. THE SPARTAN, a surfer who knows no fear, a powerful gladiator, relentless charger. Bourez is from a small band of lunatics who will go when others won't dare. He took the latest of late drops on a perfect Teahupoo beast and nearly pulled it off. That evening Michel underwent reconstructive surgery on his broken and mangled hand, into which the surgeon inserted various metal parts – Commit or be committed. Blurring the line at off the wall – Mick in a warm up session before the World Title at Pipe got under way. Mick Fanning goes Backdoor to win the round four super heat against Kelly Slater and John John Florence during the Billabong Pipeline Masters. These two sports champions, world champions – Beyond the competition, at the heart of it all is brotherhood. Mick Fanning is the champion of all champions and seems to have faced all that mother nature could throw at him with grace and courage. Through all adversities Mick has led the way on how to be a great person, something that every child and every adult can be inspired by – The man of the Year. I'm saying thanks to these athletes and men I call friends for freely giving their time and allowing me access to photograph them, even when the chips were down and the going was tough, even when they were under extreme pressure, and even when they scored the most epic waves throughout the year – THANK YOU. For without these guys, their insane courage and spectacular talents, without their sponsors, the big surf companies and the World Surfing League (WSL), this level of surfing would never have been achieved. You would not get to see these images and never get to have a glimpse into what it's like to be a Pro Surfer on tour, surfing the best waves in the world. Join me in sending good vibes to those injured gladiators in recovery and wishing everyone a spectacular and safe 2016 of surfing.